"Revolution is the only lawful, equal, effectual war. It was in Russia that this war was declared and". 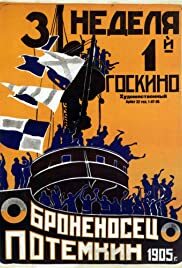 Battleship Potemkin is the classic silent masterpiece from director Sergej Eisenstein from 1925. The film is based on the true events of the Russian Revolution of 1905. The film had an incredible impact on the development of cinema and was a masterful example of montage editing.